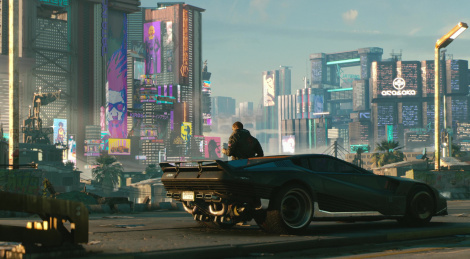 It's been years since we were first shown the Cyberpunk 2077 teaser, but CD Projekt RED's new game has come to this year's E3 with a brand new trailer. Still no gameplay footage to be seen, but that's more than enough to get our attention. Once again, this was recorded with our own equipment during the Microsoft media briefing, so expect super high image quality. No idea why but for some reason this didn’t seem nearly as amazing as I had hoped. I’m sure proper gameplay will be more telling but the general vibe seemed a bit more campy than I had hoped for. Hopefully it still captures that Witcher 3magic but this definitely didn’t get me as hyped as I was hoping it would. This looks great to me. Especially because I'm just not into the fantasy genre that the witcher falls under. But if this is "in engine" I'll eat a live raccoon. There's no way this is real time. I absolutely loved this trailer, best trailer of any game so far. The graphics and the details in everything look stunningly gorgeous and detailed. CD Projekt RED surpassed my wildest dreams, can't wait to see gameplay. Hopefully, we won't have to wait long. Thankfully you don't have to play as the generic bald headed space marine looking dude in the trailer. There are classes and customisable characters. Which was my only real issue I had outside of the super cheesy dialogue. Day 1 though whenever it releases. Probably next gen.
Well, they could be running it on a really souped up rig. So technically, it could be real-time, though almost 99% of the gamers will never get to play it like that lol. Oh!! I am glad to hear that you can choose. The trailer made it sound like it was Witcher with a fixed protagonist. Looks amazing and the trailer looked like it was at least running using their engine...Very hyped! So after watching this on my 4K TV, there are definitely a few tell tale signs that these are real time graphics we're looking at. A few instances of aliasing here and there, some weirdness in reflections, very slight pop in. But boy, overall, this really is some next level rendering we're seeing here. And it maintains an extremely smooth frame rate despite the high resolution and CG level post processing effects. So I'd agree with you. This is super high end PC footage. Since they didn't even hint at a release date, I'm gonna venture a guess that this will be a next gen title. There's no way an Xbox One X or PS4 Pro would be able to push this level of fidelity. Not without serious repercussions to performance that is. Don't forget CDPR were known for one of the worst instances of a downgrade with the Witcher 3...and that was on PC hardware. It likely won't even look like this on any platform even as a next gen title. Given these are cutscenes, I don't think it looks out of the realms of possibility. You can see trade offs on level of detail in terms of geometry and rendering for scale. For instance, Death Stranding looks more impressive in many ways to me in terms of the rendering...I think games will be able to look a good deal more impressive than that in terms of rendering next gen. I.e., Horizon 2. This is kind of Witcher 2 situation. Effectively a cross gen game. Still it looks absolutely stunning and is possibly my most anticpated game alongside the four shown tonight. But then again Witcher 3 still managed to become one of the best looking games, if not the best looking game, up until now, so I am not sure I'll even be mad if they'll downgrade C2077 a little. yeah W3 was still stunning. And it is still amongst the best. Horizon and Origins definitely surpassed in the open world stages in my opinion, but C2077 is their next big thing. I seriously doubt there will be that many rubber wheels on the road in 2077 but this looks really interesting. I have had no interest in this game until now.